Fine Fettle Multi-healthcare: TEAM FINE FETTLE ON FINE FORM!! 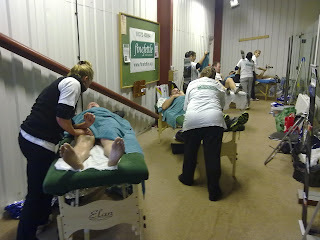 Lying awake listening to the torrential rain and driving wind on Saturday night it was hard to envisage Team Fine Fettle setting up the next day, for post event massage, in anything other than Surreys own hurricane with wind, mud and puddles. The only comfort being I had not decided to do the race myself this time!! Like true Brits we decided a little bit of wind and wet was not going to beat us so we set up camp at the start/finish line…This went well until we found that with all the pegs, guy ropes and even tying the gazebo to a metal post we still could not let go of the gazebo that had now turned into a self inflating balloon ready to launch across the running track at any moment. Defeated we then spent another 20 minutes, much to the amusement of others taking down the balloon/gazebo and researching other options. Fortunately we were led, kindly, by Nicky and Alan (Events to Live course directors) to a sheltered spot inside next to some squash courts. It was warm and dry and at that point a relief to be out of the wind. We initially set up 2 couches, thinking that being tucked away from the finish line that we may not see many runners coming to use our services… How wrong were we! I have now been banned from saying “we may not get many through today guys” as suddenly we had an influx of runners finishing the 10 mile and subsequently the 20 mile all vying for our services. Very quickly we were up to 5 couches and we were constantly treating for about 2 hours. So another successful event for fine fettle. Many of the runners were preparing for the New York and Dublin marathon and we wish them all good luck in their runs and fundraising. Team Fine Fettles next event is the “Three Mole Hills” on Sunday 28th November. This race will see teams of 3 racing up Box hill, Norbury Hill and Ranmore. A tough race but one with some fantastic views. http://www.eventstolive.co.uk/ for more information on races in the area.